This might seem like a depressing notion but it need not be. Often what holds people back from trying new things and exploring new avenues isn’t a person’s ignorance, it is their knowledge. People, especially experts and other “learned” folks, think they know the answer so they stop seeking new knowledge. It is for this reason that so many inventors and innovators are young. They don’t know “what they don’t know” so they don’t let the “knowledge of how things are done” impede their perspective. For one thing, it means we must challenge the idea that “not knowing” is a weakness and, instead, seek to embrace our ignorance as a potential strength. 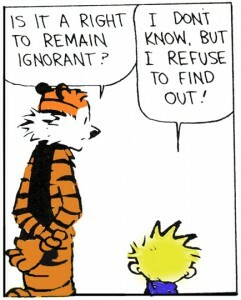 Now, embracing and acknowledging one’s ignorance is not the same as remaining ignorant–which is a bad thing. Rather, to remain aware of one’s ignorance is a powerful tool for staying intellectually humble, curious and open-minded. These traits, in turn, will make you more adaptable and, thus, more likely to survive–and thrive–in today’s constantly changing world. So go ahead–unlearn–and start putting your growing ignorance to good work.